How do we stop countries from exporting corruption? When the Canadian energy firm Griffiths Energy International Inc. bribed a Chadian public official to obtain oil blocks for exploration, it hurt one of the least developed countries in the world. When the Siemens Industrial Turbomachinery paid bribes to senior executives of the Russian state-owned gas company to supply gas turbines for a pipeline construction, it contributed to corruption in a country that is seen as highly corrupt already. In 2013, these cases were uncovered and resolved, but these are exceptions, not the rule. In fact, just four countries of the 41 in the Organisation for Economic Cooperation and Development (OECD) are actively working to stop foreign bribery by their companies in overseas markets. Fifteen years have passed since the OECD Anti-Bribery Convention was introduced to the world. Under this treaty, leading economies made commitments that they will criminalise, investigate and prosecute those individuals and companies that bribe public officials of other countries. When looking at the performance of the countries that are parties to the convention, it is obvious much needs to be done to reach the goal of a corruption-free global economy. Although foreign bribery may be less visible to the citizens of the bribe-givers’ countries, these countries and their leaders are obliged by the convention to ensure companies are not paying bribes to corrupt civil servants and public bodies hundreds or thousands kilometres away from home. 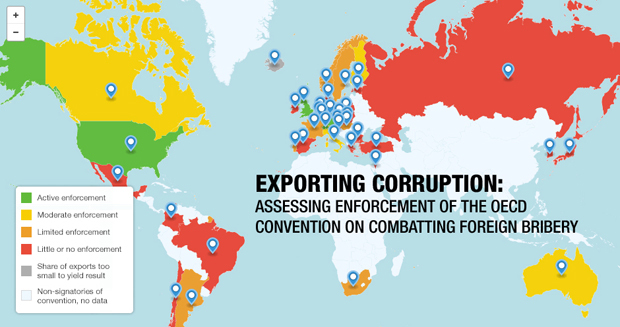 Sadly there are still 22 countries showing little or no enforcement of the OECD Anti-Bribery Convention. Those that fail to investigate and prosecute foreign bribery include Japan, Russia, Spain, South Korea and the Netherlands. Eight countries have limited enforcement and five countries show moderate enforcement efforts. See the full list here. There are a few improvements that can be reported, but the performance of the majority of the reviewed 41 countries that agree to combat foreign bribery in international business transactions is far from satisfactory. Only two countries have improved since last year – Canada and New Zealand – and two countries have regressed: Bulgaria and Denmark both dropped from the “Limited Enforcement” to the “Little or No Enforcement” category. The classification of other countries has not changed since last year’s report. In 2013 Transparency International made a number of recommendations on organisational and substantive issues that are still relevant. We give an update on their status in the country reports. In countries with lagging enforcement governments should provideadequate support, including staffing and funding for enforcement. Continuation of a rigorous OECD monitoring programme remains essential. The OECD Working Group on Bribery has a good record of involving civil society organisations in the review process. It is particularly important that critical civil society organisations are also included in the on-site visits. Furthermore, governments should make the replies given to the questionnaires available to civil society organisations. We recommend that the OECD convene meetings in countries where there has been substantial foreign bribery to discuss how their interests can be better represented in foreign bribery proceedings. The OECD Working Group on Bribery should consider how to best obtain inputs from the countries affected by foreign bribery, including from the private sector and civil society. The Working Group on Bribery should prepare a study on the practice of settlements, including on court approval, transparency and deterrent effects. Governments and the Working Group on Bribery should collect and publish data on mutual legal assistance requests relating to foreign bribery. In many countries details of cases, whether pending or concluded, are not available. Furthermore, a limited number of countries (including Germany) anonymise cases by withholding all details that would enable identifying companies or individuals prosecuted or convicted. This prevents the media and civil society from staying informed. Publication of enforcement activities and judgements has deterrent and thereby preventive effects; thus, information on ongoing and concluded court proceedings and settlements should be published in detail by governments.